Headlies: WWE Opens A Haunted House - WrestleCrap - The Very Worst of Pro Wrestling! Armonk, NY– WWE announced their latest venture outside of professional wrestling with the grand opening of the official WWE Haunted House at the Armonk Halloween Spooktacular and Pie-Eating Contest. The amusement has various attractions that contain a unique WWE twist. On the first floor, people must traverse the terrifying process of having your indie wrestling credentials destroyed as you’re given a new WWE-approved name. People are given “Hi My Name Is” stickers with hand-written generic and uninspired names such as “Chad Greg”, “Gina Love”, “Chuck Berger” and “Todd”. In the foyer, fans can look into the spooky “Mirror of Future Gimmicks” where they can see how they will be portrayed on television. Beyond the mirror lies “The Hallway of Creative Has Nothing For You”. 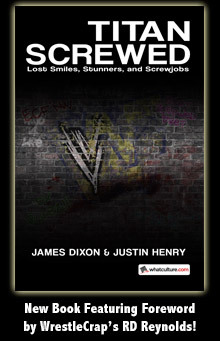 Several members of WWE’s writing staff line the hallway, simply shrugging in your general direction as you walk by. The main stairway to the second floor will turn into a slide at random times, mimicking the difficulty of WWE Superstars ascending to the next level. There are also several trap doors in the house meant to mimic WWE’s ratings plunge. People must reach for the elusive set of brass rings dangling from the ceiling in order to reach the upper floor. Once there, they must endure deafening boos and annoying chants of incredulous fans. Following that nightmare, they must proceed through the “Bathroom of Stupid Things Posted On Social Media” and on to the final room: a small theater showing back-to-back viewings of Halloween Havoc 1991 and Halloween Havoc 1998. Those brave enough to survive the horrors of the WWE Haunted House will receive a free 3-month subscription to the WWE Network and your choice of a WrestleMania 31 Jailbird Work Shirt or a Naomi ponytail hat. Headlies: It's The Great Pumpkin, Dixie Carter! Induction: 2011 Halloween Divas Battle Royal - AJ Gives Nerds The World Over a Geekality! 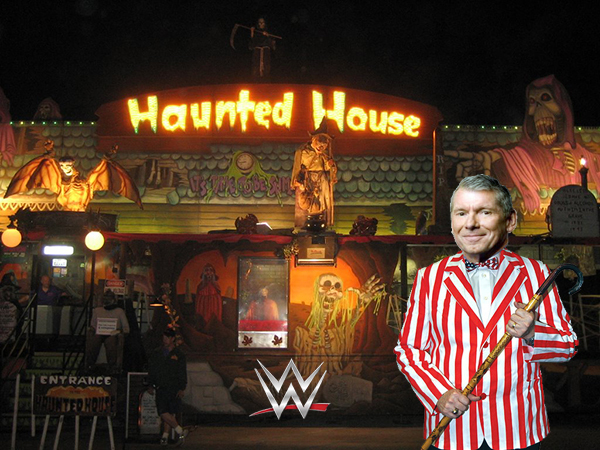 13 Responses to "Headlies: WWE Opens A Haunted House"
It’s frightening how funny this is! You know, i keep tellng myself i’m gonna watch Halloween Havok for my Halloween Movie Marathon one of these years and i’ve still not done it…shame…shame on me. The moment you see Tony Schiavone in his uber creepy get up all will be revealed. You mean the one of Tony as a vampire from 1993? That is frightening! Legend says that when the moon shines bright and the midnight wind is still, you might very well catch a glimpse of the fabled Funaki scuttering about the rafters. This has to be the best ever. This should really be an attraction at a 6 Flags or Universal Studios somewhere in LA or Florida. The moral of the story going through: nobody ever says when I grow up I want to be a professional wrestler. One of the best Headlies yet. Absolutely hysterical. Armonk is in New York dude. How do I know? I work there; I’ll be the seventh of 83 Doink the Clowns during your Haunted House walkthrough. Do customers get handed cards wishing them luck in all their future endevors when the exit the haunted house?